The Post Office has waived the fee for a permit. With EDDM you save the cost of buying a mailing permit. 2. 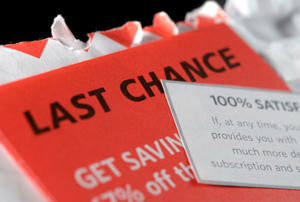 No Mailing List Needed for Every Door Direct Mail. The Post Office is promoting a simplified mailing address so there is no need for a mailing list. All that is required is a label saying "Postal Customer" and the Post Office will deliver your piece to the mailing routes that you request. 3. Larger Pieces = A Larger Response. Mailing flats must be at least 6.25" x 9" or larger up to a 12" x 15". This allows you plenty of space for your message at a much reduced postage rate. 4. Just Take Your Mailing to the Post Office That Services the Route You've Chosen. You have the option of dropping off your mailing and paying for the postage with cash, check, or debit card. Benchmark Printing prepares the mail for you including all paperwork and will even drop off at the Post Office for a small delivery fee. This way you get the best postage rate and the confidence that your direct mail is being delivered quickly and efficiently.